What do you think will be the next big things in eLearning industry for 2017? The year 2016 has already seen a massive development in eLearning field. Now that the year is about to end, let’s take a glimpse at the emerging eLearning trends of 2017 based on insights from eLearning industry experts. As technologies keep emerging, the year 2017 could be the most disruptive years for eLearning industry. 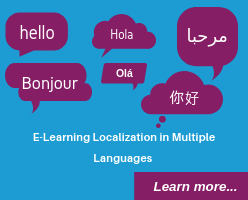 Analysts predict that global e-Learning market is expected to grow at an average of 23% by 2017. 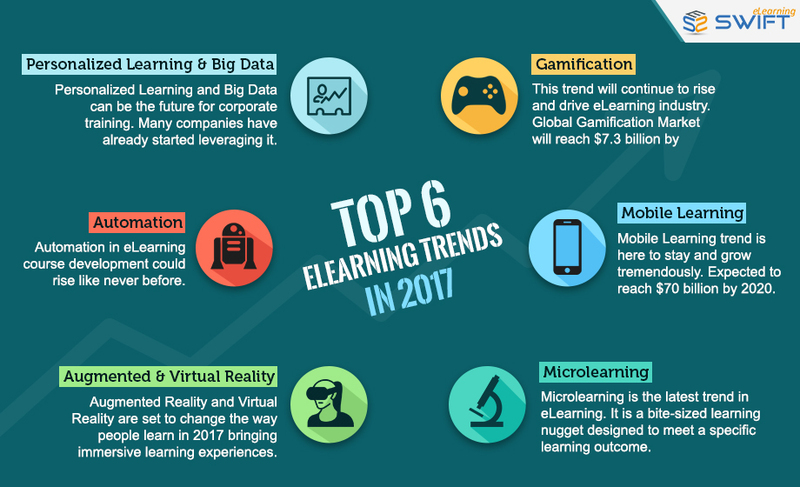 Here are the top 6 eLearning trends in 2017 you should know. The gamification trend will continue to rise and drive eLearning industry. As per recent reports by Docebo, the Global Gamification Market will reach $7.3 billion by 2021. Organizations will be investing more in creating gamified learning content with serious games to enhance workforce productivity. Gamification in eLearning motivates the learners to perform better. Surprised? Yes, the Mobile Learning / mLearning trend in eLearning is here to stay and grow tremendously. Mobile learning market is expected to reach $70 billion by 2020. More than 72% companies are now embracing mobile learning as their preferred mode of learning delivery [2015 Asia-Pacific Skillsoft survey]. The rise in Bring Your Own Device (BYOD) policy has fueled the impetus to mobile learning like never before. Mobile learning facilitates real-time collaboration enabling social learning where learners can share their ideas with their peers. It also supports 70:20:10 Learning & Development framework which states 70% of learning happens on the job at the moment of the need. Microlearning is the latest trend in eLearning. It is a bite-sized learning nugget designed to meet a specific learning outcome with 4 to 5 minutes in length, or shorter. 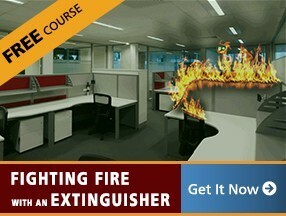 An ideal fit for distracted learners with low attention span. It is easily accessible via mobile devices providing just-in-time performance support. The eLearning trend – Automation in eLearning course development could rise like never before. Some authoring tools in the market have already started to auto-generate eLearning courses making eLearning developer’s job easier. 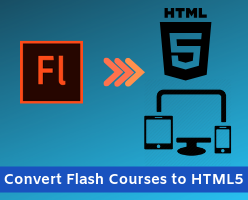 This means the eLearning course development is going to be faster and cheaper. Most of the tools in eLearning market provide the flexibility to publish responsive eLearning content that supports multiple devices from a single source. Collaborative authoring tools like Composica, Lectora Online, Elucidat and Articulate Rise are set to make the eLearning projects even faster. Disruptive technologies like Augmented Reality and Virtual Reality are set to change the way people learn in 2017. AR and VR put the learners into real-life settings through simulated and virtual environments and bring immersive learning experiences. Augmented learning is going to be one of the most sought learning and development strategies in the coming year. Many companies are yet to tap into the power of AR and VR. Virtual Reality: As the name suggests, VR creates simulated or virtual 3D environment that helps learners to practice beforehand (For example: Flight Simulators). Requires VR devices such as Oculus and Samsung Gear VR to experience the virtual world. Augmented Reality: AR superimposes or simulates computer generated artificial objects in the real environment and enables learners to interact with it. Personalized Learning and Big Data can be the future for corporate training. Most companies have already started leveraging Big Data to bring the personalized learning experiences. One size doesn’t fit all – every learner has individual learning needs and styles and this is where personalized learning comes into picture. Personalized learning is aimed at bringing the individualized learning experience while addressing personal learning needs. And Big Data plays a significant role in providing personalized learning experiences. The data collected from learner’s interaction with the course via LMS provides valuable insight into the learner’s achievements. Analyzing this data helps us create personalized eLearning tailored to meet learner preferences and organizational needs. We need to wait and watch to find out which eLearning trends would be potential industry game-changers for 2017. Hope these predictions help you devise the right learning and development strategy in your organization for the coming year. 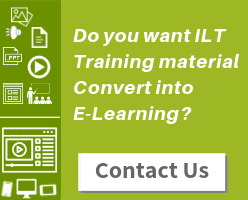 Watch out this space for future developments and trends in eLearning.